If you're planning a corporate event, family reunion, graduation, birthday party or any other type of event, Magic Special Events can help you turn it into a success. As the leading event planners in Richmond VA #1 choice since 1978, we have experience with all types of special events. We have a dedicated team of professionals as well as all kinds of equipment and props to make any event memorable and fun for everyone. Partner with us in planning your next special event so you can enjoy your event and rest assured that everything will turn out perfectly down to the smallest detail. Corporate Events - If you want to show your employees how much you appreciate them, why not throw them a themed picnic? We can organize a company picnic around a theme such as tropical, USA, South of the Border or any theme you prefer. Life Celebrations - It's a big job to organize a family reunion, wedding or any life celebration. We can take a load off your shoulders and handle the decor, catering, entertainment and any special features you desire. Parties - Whether it's a birthday party, graduation, holiday party or just an excuse to get together with lots of friends and family, we can help make it fun and special. If you want carnival games, midway rides, live entertainment, casino equipment or photo booths, our party rentals HQ in Richmond VA will provide anything you need. Event planners in Richmond VA know. You can too. Magic Special Event will work with you, find out exactly what you need and help you create the look and atmosphere you want your event to have. With almost 40 years of experience working with people and companies throughout the Southeastern and Mid-Atlantic states, we know exactly what it takes to put together a successful event! Planning an event takes quite a bit of time and effort. There are lots of details to remember, from picking a venue to arranging the catering, party rentals and entertainment. If you're as busy as most people, it's more efficient to hand the major tasks over to professionals. Discover what the leading event planners in Richmond VA know, you want Magic Special Events. We've been helping people organize successful events of all types since 1978. Regardless of what you have in mind, we can help you take the stress and hassle out of your special event needs so you can simply enjoy yourself! Corporate Events - It's always nice to reward your employees with a great party. It's also a way to bring people together and promote teamwork. It’s no secret Magic is the first call from the most experienced corporate event planners in Richmond VA and we can help you too organize the ideal event, whether it's a company picnic, holiday party, milestone celebration or employee appreciation day. Unique Design and Special Effects - We provide top quality design, decor and special effects to meet your needs. From high impact lighting to 3D renderings to balloon drops, we give your celebration a professional look and atmosphere that your guests will remember and talk about. Specialized and Theme Events - If you want a certain theme or a particular type of entertainment at your event, we can provide it. We can get you entertainers such as magicians, palm readers or face painters. We can supply photo booths, inflatables, casino games, carnival rides and just about anything else you may need. Rentals - We can provide all of the equipment you need, such as tents, amusement rides, outdoor furniture, lighting, video and sound equipment and much more. Our special event productions and rentals will make it simple for you to have the party of your dreams. 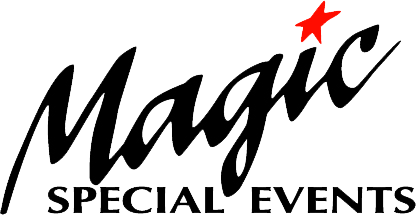 Event planners in Richmond VA know, Magic Special Events is dedicated to helping you pull off your event seamlessly. Whether you need full service like many of our corporate event planners in Richmond VA, or just party or rental equipment to give your event an extra special atmosphere, contact us and we'll find a way to make it happen. If you're planning a special event, you want to make sure that every detail is covered and that nothing is overlooked. Magic Special Events has been the leading choice for event planners in Richmond VA since 1978. Now, we produce events throughtout the Mid-Atlantic and South East regions proudly serving. the entire spectrum of personal and business events. Putting together an event, whether it's a party, wedding, concert, fundraiser, or anything else, requires a great deal of planning. You need to find the right location, arrange parking, deliveries, food, seating, and figure out a schedule for everything on the agenda. Trying to do all of this on your own is overwhelming and makes it hard to enjoy yourself. The most successful events are handled by experts. We work with many of the most experienced corporate event planners in Richmond VA, having helped create numerous events for all types of businesses, including Fortune 500 companies. When you're planning a special occasion, you need the right equipment and supplies. Our special event productions and rentals provide you with everything you need, such as event furniture, tents, sound and video equipment, a stage or dance floor, special effects, amusement rides or anything else that fits your needs. It's your event and our mission is to provide you with anything you need to create the atmosphere that's just right for you and your guests. While there are other event providers in Richmond VA, our experience, dedication, and versatility set us apart. We provide all the tools you need to help you prepare for any occasion. On our website, you can read reviews from satisfied customers who appreciated the way we handled all of the details and helped them put on the perfect event. Discover what corporate event planners in Richmond VA already know we have the knowledge and resources to meet your needs. We work with everyone - individuals, families, businesses, and organizations to plan events of all types and sizes. Whether you want to celebrate a child's graduation, raise money for your school or throw a party for your employees, our services ensure that you'll have everything you need. With our special event productions and rentals, you can sit back and enjoy the festivities and let us handle the details.